"Experience the SAP IBP Difference"
Whether looking to implement SAP IBP or an existing user, this one day customer event aims to give an overview of the feature rich functionality of the suite of IBP modules through detailed system demonstrations and presentations. 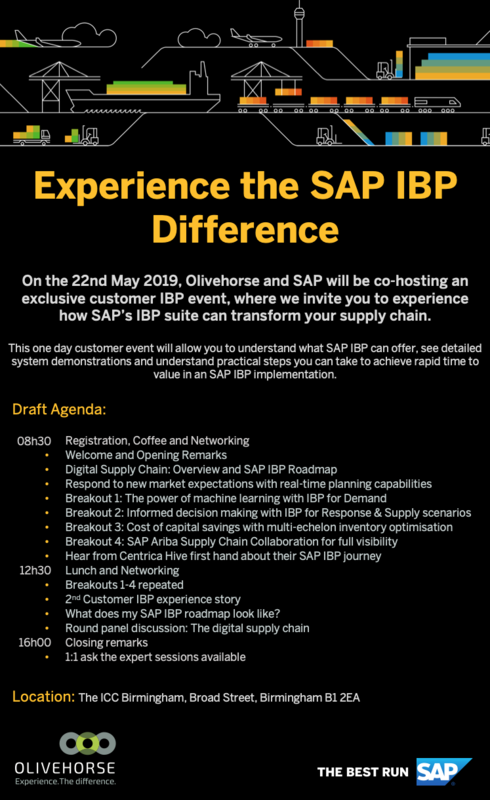 The day will also allow you to network with fellow SAP customers, talk to Olivehorse and SAP experts about any specific IBP questions you may have and to understand the practical steps you can take to achieve rapid time to value through SAP IBP. Centrica Hive and a second (tbc) customer will also be sharing their recent SAP IBP journeys. Centrally located at The International Convention Centre (ICC) in Birmingham, our venue is only a short walk away from Birmingham New Street Rail Station, a 15-minute train ride from Birmingham International Airport and just off the A38 Aston Expressway. Why not relax on your journey and take advantage of a 20% discount on pre-booked Virgin Trains tickets? And for those driving we can offer a discount code for reduced parking at the next door Birmingham Arena for the day. Travel information will be in the confirmation email after registering. Use the form below to register today, and we look forward to seeing you in Birmingham on the 22nd May. If you have any questions on the event, or can't attend on the day, then please contact us on ibpevent@olivehorse.com.